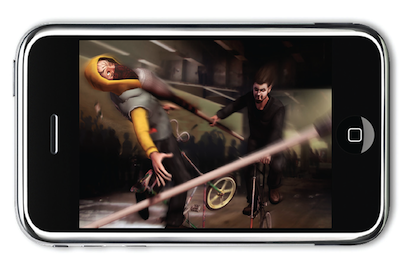 Tall Bike Joust introduces iPhone gamers to a new experience in extreme sports within the underground subculture of mutant bicycle clubs. In TBJ, gamers are in the rider’s seat as they compete in jousting tournaments on tricked-out freak bikes within a complex 3D fighting platform. This arrives just when we were lamenting the lack of interesting bike apps for the iPhone. For more on the app and the creator Ryan Doyle, see the Bike Blog NYC post and interview. Ryan is an artist, freak bike aficionado, and member of the Black Label Bike Club. See video of his Regurgitator on YouTube. Seems even losers on bikes are making apps these days. Tall Bike Joust is available on 01/01/10.